HADITHA, Iraq (April 27, 2006) — Staff Sgt. Jason C. Ramseyer will be remembered for the countless sacrifices he made for his brethren Marines. His final sacrifice came when he was killed April 21, 2006, by an improvised explosive device while on a convoy in Haditha in Iraq’s Al Anbar Province. 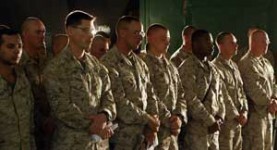 Ramseyer, 28, was honored by his fellow Marines during a memorial service at the Haditha Dam here April 23, 2006. The Lenoir, N.C., native was remembered as a committed leader and devout family man by those who served with him. 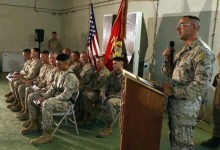 “He was by far the greatest leader of Marines I have ever had the honor of working for,” said Sgt. Michael Ferguson, 23, platoon sergeant assigned to 3rd Battalion, 3rd Marine Regiment. The Hawaii-based “America’s Battalion” arrived in Iraq about six weeks ago to replace another Marine battalion conducting security operations in this region along the Euphrates River. Ramseyer was the platoon commander for the battalion’s Forward Command Post, also known as the “Jump CP.” His job often required him to travel on Al Anbar’s dangerous roads to provide security for Iraqis and other Marines. “The world was a better place when Staff Sgt. Ramseyer was here,” said Ferguson. Ramseyer joined the Marine Corps in June 1996. He reported to the Hawaii-based 3rd Battalion, 3rd Marine Regiment in November 2003, and deployed with the unit to Afghanistan in support of Operation Enduring Freedom last year. For duty in Iraq, Ramseyer was hand-selected by Lt. Col. Norman L. Cooling, the battalion’s commanding officer, as the platoon commander for the Jump CP – a duty his Marines say he performed with consummate professionalism and unparalleled valor. Kiernan also said that aside for his love for the Marine Corps and his Marines, Ramseyer was also a dedicated family man. Kiernan remembers one Christmas Eve staying up all night assisting Ramseyer assemble a trampoline for his children. Ramseyer’s past duty assignments include: 3rd Battalion, 8th Marine Regiment at Marine Corps Base Camp Lejeune, N.C.; mortar instructor at The Basic School at Marine Corps Base, Quantico, Va.; martial arts instructor at the Martial Arts Center of Excellence at Quantico, Va.
Ramseyer’s personal awards include the Navy and Marine Corps Commendation Medal, the Navy and Marine Corps Achievement Medal (3rd Award) and the Combat Action Ribbon. Ramseyer is survived by his wife, Amanda and his three children, Caleb, Riley and Cadence.